Glacier Country Kayaks is one of the most scenic kayak locations on planet earth!. Join our 3 hour kayaking tour in Franz Josef Glacier. 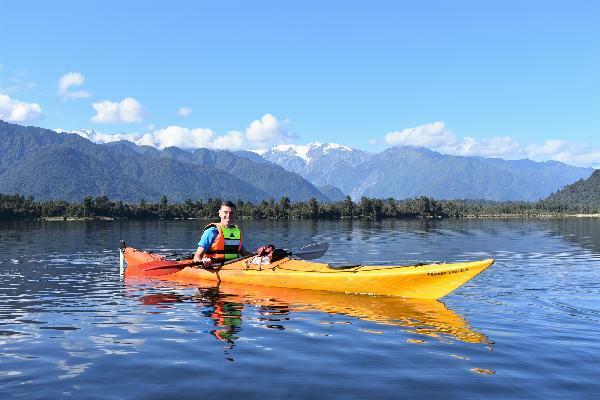 Join us on a unique kayak adventure and kiwi sanctuary tour, just minutes from Franz Josef Glacier! Glide effortlessly across the lakes mirror-like water, enjoying panoramic views of the surrounding high mountains and glaciers. Our stunning lake was created by the mighty Franz Josef Glacier as it retreated some 14,000 years ago. Now it sits calm and reflective, sandwiched between the mountains and the sea. At the back of the lake we navigate our kayaks deep into the heart of the Okarito Kiwi sanctuary. Paddle silently past some 900 year-old kahikatea trees, all to the sound of native birdsong. Glacier Country Kayaks is locally owned and operated, so like true west coasters, we'll get out there rain or shine! FREE Photos provided with each tour! I can highly recommend this kayaking trip. The setting is unbeatable and our instructor Johnny was great - so friendly and full of knowledge about the area. A wonderful way to spend a few hours in an idyllic location. So good! Absolutely loved this!! We took our 3 teenagers and they too loved it. Would do it again in a heartbeat! the morning view is amazing! I did kayaking yesterday morning and it was amazing :) We were the only people booked the kayak at morning so it was kind of private tour ;) The weather was just perfect and the guide who was really friendly. He explained well about the nature story and took a lot of pictures for us for free!! Definitely recommend to do it! Especially at morning or before sunset time! Great relaxing 3 hrs on a pristine lake in a wonderful setting with great guides that would put the most inexperienced kayakers at ease and guaranteed to provide an enjoyable time. Thanks guys for a lovely time. Your message has been sent to Franz Josef - 3 Hour Kayak Classic. You should hear from them shortly. Please note: all responses will come directly from Franz Josef - 3 Hour Kayak Classic, and not the team at Bookme.